Having driven the DS 3 and 4 previously I think it’s safe to say that the quirky French firm are most definitely creating a stir with a range that is known for its innovative styling and retro touches. DS themselves state that On Thursday 6 October 1955, an enduring icon was unveiled. The original DS made its debut at the Paris Motor Show, beneath the dramatic vault of the Grand Palais. The response was immediate and overwhelming: 12,000 DS 19s were sold that day and by the end of the show no fewer than 80,000 orders had been taken. DS was like nothing that came before, blending avant-garde styling with true engineering innovation to stunning effect, and sixty years later its legacy is clear to see in the very latest DS models. And in the DS 5, have we indeed found the spiritual successor to that original and groundbreaking car? Historically, DS have always looked different and interesting, a tradition upheld by the DS 5 which, it has to be said, looks like nothing else on the road today. Boldness and strength of conviction have clearly dictated the direction that DS have taken with the styling of this, their largest offering and my my, doesn’t it look fantastic. Those large Chrome Sabres running across each of the front wings are certainly devisive but when combined with the accompanying Chrome Side Rubbing Strips and deep Perla Nera Black metallic paint, the overall effect is striking in the extreme. The de rigueur black privacy glass across the rear of the car adds to the air of elegance that the DS 5 exudes and helps to create what DS say is the muscular flow and balance of the exterior. I love the look of this car, in my mind it successfully mixes the looks of a traditional estate with the more aggressive, go anywhere stance of a crossover SUV. The interior continues the avant-garde opulence with a light and airy cabin aided considerably by the three skylights, one each for the driver and their passenger and a larger over the rear seats. Each can be closed or opened independent of each other and highlight DS’ desire to take their design language to the next level. Inside you’re greeted by extremely comfortable heated, Sand Beige Leather seats with driver electric lumbar adjustment, massage and memory functions which match the ambience that the DS creates perfectly. Two centre consoles that group all main controls and driver information precisely where you need them, mean that everything you need is on hand and available with the minimum of effort. 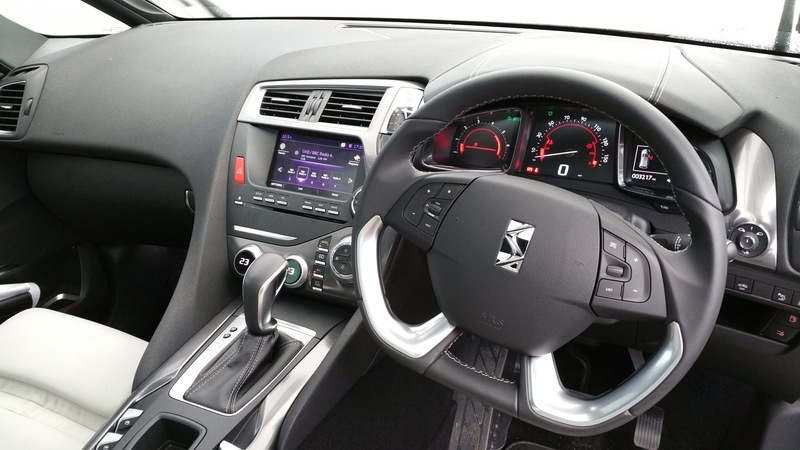 Where the DS 5 really takes your breath away is in the design and use of the dashboard, controls and centrally realised touchscreen ,including, as it does, Sat Nav, DAB radio and music streaming controls. What impresses most however, is the fantastically extravagant analogue clock just to the left of the steering wheel, an elongated design that encompasses all of the idiosyncrasies that DS are rightfully celebrated for and I love it. With aircraft style switches above your head and throughout the central console the interior is a place that you will not tire of, a place where you interact with the years of culture and sophistication that remain behind that iconic nomenclature sat proudly on the front grill and throughout the sophisticated interior. 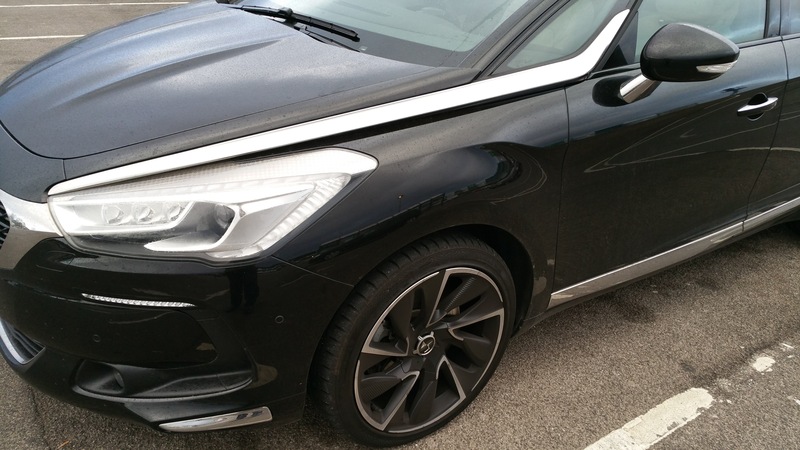 With this particular DS 5 arriving on test with the excellent BLUE HDi 180 S&S EAT6 auto engine and transmission which, for me, offers almost the perfect combination of power and efficiency, whilst still allowing the driver to have fun. After all, isn’t that what most of us look for when motoring on? The BLUE HDi diesel technology under the bonnet meets and exceeds the very latest Euro 6 standards yet still delivers 178bhp at 3750rpm and a hugely satisfying 295 ft/lb torque at 2000rpm, all the while delivering up to a claimed 62.8mpg and emitting CO2 of 117 g/km. And make no mistake, despite it’s imposing road presence, this is a real drivers car. Suspension that keeps the DS flat through the bends and quick and accurate steering allows you to point the DS exactly where you want it to go which, when combined with the excellent levels of torque available from just 2000rpm allows you to sweep through the corners with ease. The 1997cc inline 4 cylinder diesel engine pulls the DS 5 from 0-62mph in a surprising 9.2 seconds and allows for swift, yet safe, overtakes if and when the need arises. This car feels like it can take you and your passengers across continents in complete comfort such is the feeling of confidence you get from the driver’s seat. 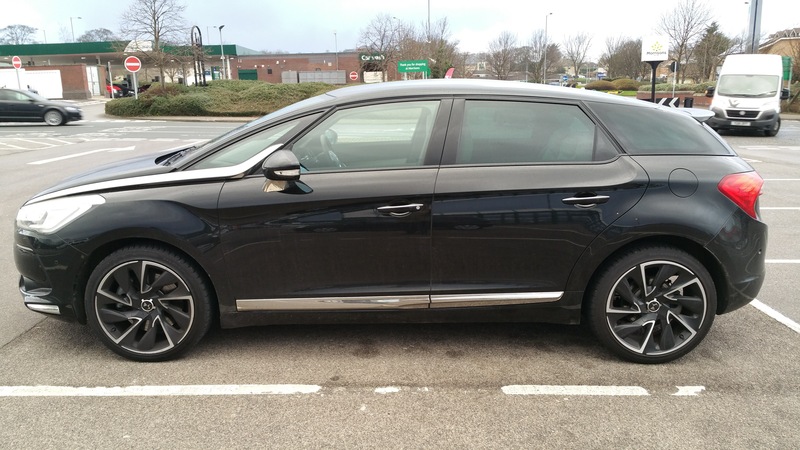 As a family car you really can’t go wrong with the new DS 5, there’s more than enough room in the back for 3 adults so those of us with children will certainly have no problem squeezing them into the rear of the DS, even allowing for booster seats. Boot space is excellent at 465 Litres with the seats up, expanding to 1,288 Litres with the rear seats folding flat which points to the DS 5 being more than capable of adapting to the different scenarios that a family often finds itself. And that’s it with the DS 5, it offers people something different to the rather more generic choices out there. It’s able to be a sophisticated, high quality, sports tourer that is both comfortable and well specified whilst also offering families a practical, spacious and great value choice, a choice that’s refreshingly different from the competition. DS have traditionally created cars that deliver on many different fronts, cars that celebrate their individuality with styling that is bold, stunning and distinctive, cars that are well specified with up to the minute technology, cars that ride beautifully (harking back to the original DS with it’s novel hydropneumatic suspension which even included an automatic levelling system and variable ground clearance) and cars that are exciting to drive with engines that deliver an efficient and economical manner of transport. It’s most definitely a proper DS.